I had a crazy notion about two weeks ago that it would be a good idea – instead of having five different notebooks of varying shapes and sizes plus one note pad scattered over my coffee table, and side table in the lounge and two more large exercise books and various bits of paper with random notes, quotes and ideas on scattered about the creative room – wouldn’t it be a good idea to have it all in one place…..
All was made clear. 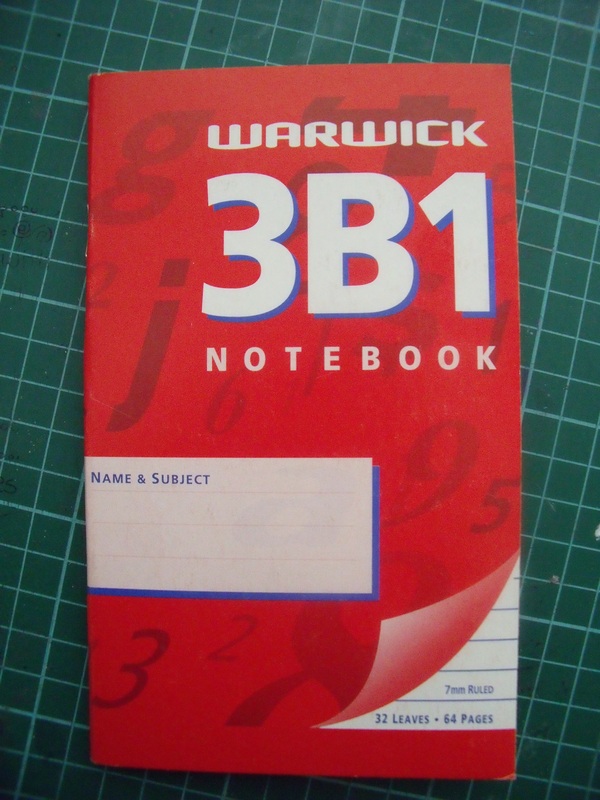 I had about seven notebooks still sitting in a drawer from the summer before last when they were on sale for five cents each – I bought twenty of them, just because they were five cents each! I took the covers off and painted them. I painted them with my two favourite colours cerulean blue and viridian green. There’s a wee touch of white in there too….. I poured glossy mod podge over to stop the paint scratching off and when that was dry gave each cover a good coating of car polish and buffed them up. Mod podge is not the best sealer around. When dry it still has a sticky tack and a bad habit of making things stick together when you don’t want them to. The car polish puts a sleek shiny sealed surface over the mod podge and solves that problem. I made the cover – and I just love how it has turned out! 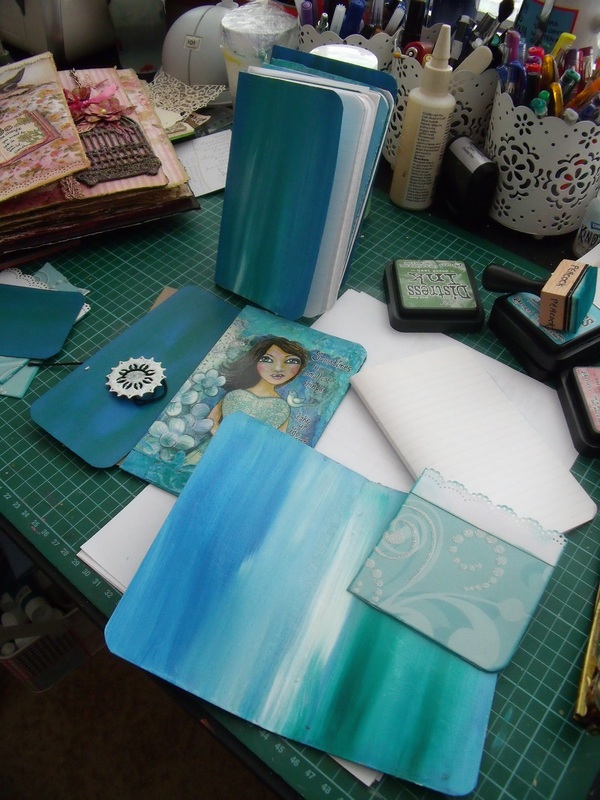 I used one of my postcards made from the original painting and embedded it onto the hardboard cover with texture paste which I then painted with the cerulean and viridian paints. The rest was pretty straight forward. I made some little pockets to hold the odd bits and pieces that might come floating by. Fiddled about a bit with the spine to ensure it was strong and sturdy and could do what I wanted it to do. Bought some hat elastic and wrapped it around the spine inner, which was then glued to the spine outer – meaning no-ones going nowhere baby! 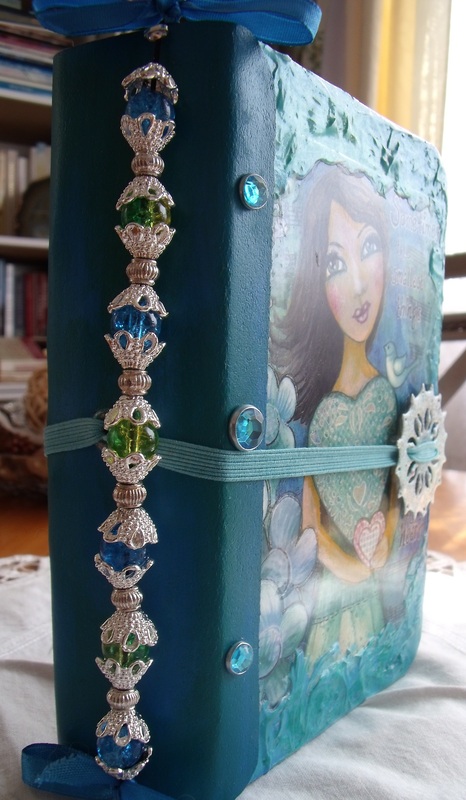 slipped the notebooks into place and voila – one artists organiser complete with the obligatory spot of bling….. Adding tabs ensured there is, amongst other things, a place for notes, a place to list things I want, a place to list gift ideas, a place to keep track of giveaways and winners of giveaways, a place for ideas, a place for quotes, a place for tracking expenditure and another for tracking earnings [giggle!] and a spare place for something else that might pop up. If you peer closely into the centre of the book you will see the hat elastic doing its job and holding the notebook into the spine quite snugly. And that my friends, is my version of an organiser – now to find out if it holds up and actually works….. she should do everything but make my morning coffee! 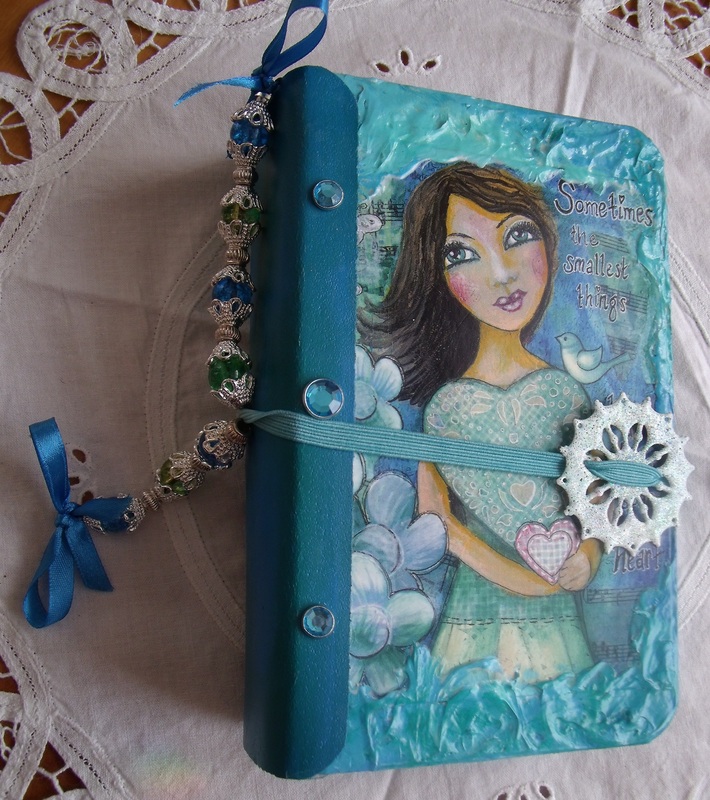 This entry was posted in Creations From My Craft Room and tagged But does it make the coffee?, diy, faux filofax, make it yourself organiser, Mixed Media, notebooks and hat elastic - who knew!, organiser, organizer, Paper Crafting by thecontentedcrafter. Bookmark the permalink. 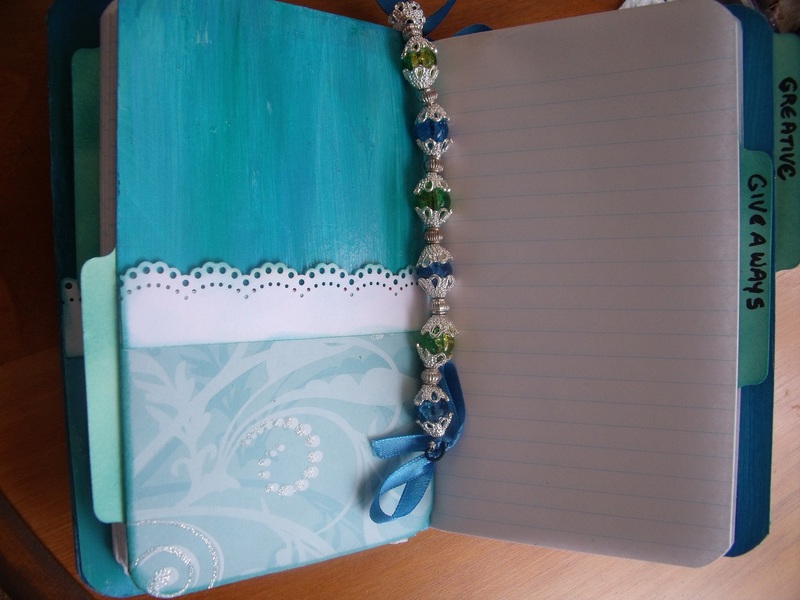 I’ve always loved handmade books. I’d think anyone would appreciate getting one of yours as a gift. The explanations and photographs are excellent. This is beautiful, Pauline. I wish for some of your creativity 🙂 Like you, if I see notebooks on sale, I’ll buy them just because they are on sale! 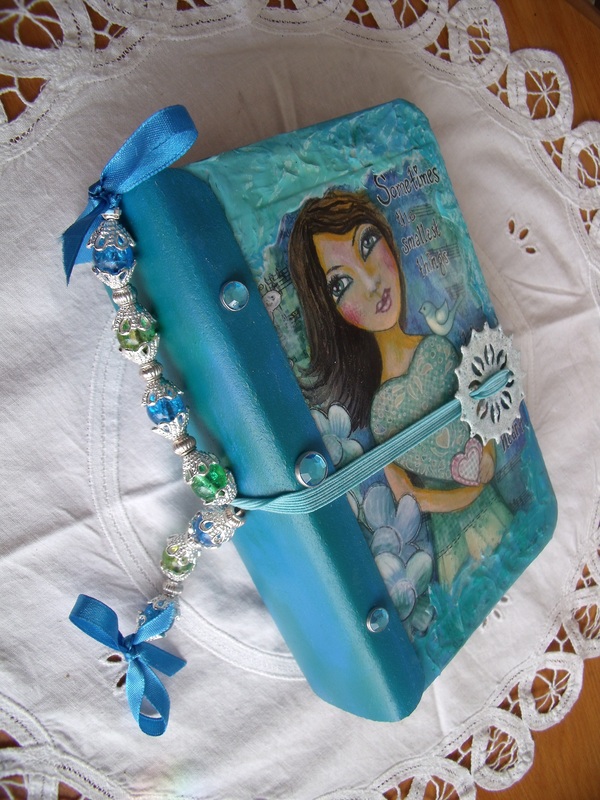 I have covered photo albums with fabric over the years, but haven’t done any of recent. I will share the next one I do with you. Enjoy your week, Pauline. I just know you are going to have a great week. All is well with me. A fantastic result Pauline! What a handy dandy idea you came up with. I am tempted to make one but it will have to wait until I hit some shops to source the stuff needed. Not nearly as clever with the arty side so might make mine more of a quilted cover, hmmm, will have to consult my stash. Have another tea cosy idea on the boil ( 🙂 ) so will put this one into my to do list. Did you have your tea in your cosied tea-pot this morning? I think a quilted organiser cover would be lovely. If you are anything like me, writing things to do on a to-do list is a bit of a hobby – that’s all I ever do – just write ’em down! We will both be well organised for the next while then – no matter where life takes us! Absolutely lovely! 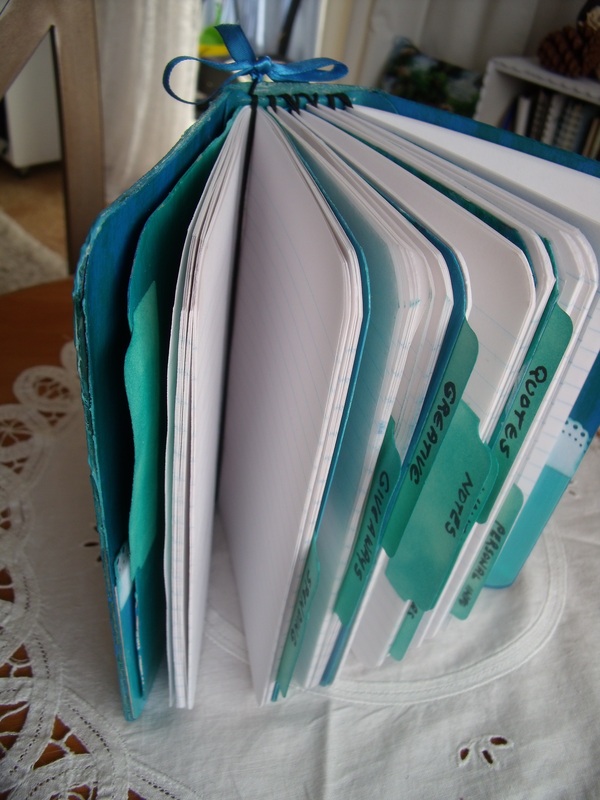 How did you make the spine so it was wide enough for multiple notebooks and then attach the elastic to hold the notebooks in place? I think I have answered that question in a previous comment – have a read through and if you need more info I shall try to provide it. Oh yes… I found your explanation in a previous comment. That was exactly what I was looking for. Again… such a lovely project. Beautiful work. Oh, my . . . gorgeous!!! PS…I just watched the tutorial, so now I understand about the elastic. Clever and so fun. Ah, I just gave a rather rambling response 🙂 I did it differently to the video. Oh! Then I must go back and read that comment. I love the colours you’ve used Pauline. The cover is so pretty. What I love most about this whole post is the phrase “creative room” in the first paragraph. I have a sewing room, and at the moment it’s in need of a big purge. I’ve started and am slowly working my way along each shelf. My thought has been to also use the room for my writing by setting up my laptop in one corner. Now I’ll be calling it my creative room instead of my sewing room! It would also mean that I can use the laptop any time I want instead of having to share the one in the study with my husband, who always seems to be using it when I want to. How you can turn such a humble item into such a thing of beauty, I don’t know!! I envy your talent Pauline, I truly do. This is stunning. Simply gorgeous! I love the idea of making something so utilitarian into something pretty to look at. Binding them all together would save about 80 sq ft in my purse (perhaps a slight exaggeration). The addition of the little folders is genius! I always have scraps of paper tucked here or there. Just a book of those would do me wonders. Beautifully done! oh so pretty, so pretty!!!! love it. What a great idea. I love the color of yours, girl + mixed media. Those would look very pretty in your etsy store! :-) I watched the video and loved her accent, she has such enthusiasm that I want to run out and try to make one instead of all my notebooks scattered in places here and there when I sit down to write down ideas etc. I need an idea book like that! 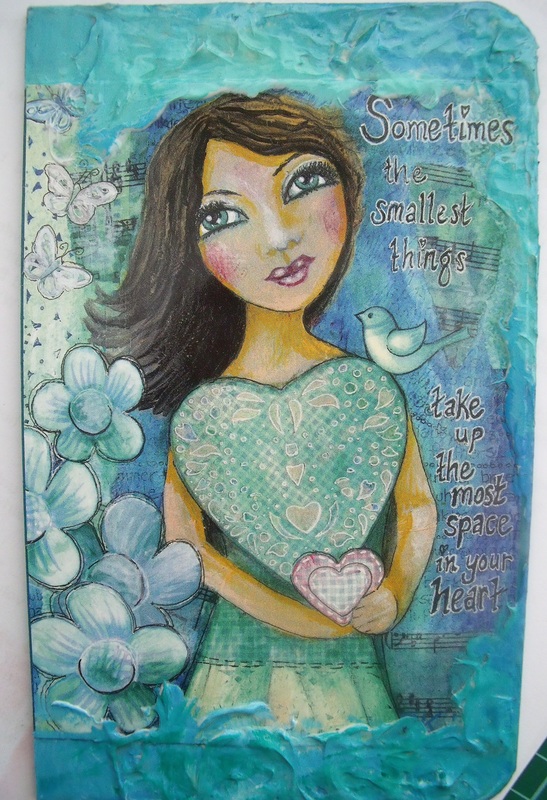 I admire how you are able to put it all together + make it look like it always was that away;-) You are a natural with mixed media:-) I know I keep telling you that, but you are exceptionally good:-) I also admire how you use color..I love color, so I love to see those colors used! Amazing the amount of work! A wonderful treasure! Thank you Pati – now I know what to do the next one will be quicker to make – I hope! That is beautiful, Pauline, simply beautiful! I love journals and notebooks, so I was salivating over this. You are so creative. I’m curious how long it took you to make this? If it wasn’t too time consuming, you should make more and sell them. I’d be first in line! It took the best part of a week to make – but that was because I was sorting out how best to make it – I didn’t want to have something that fell to pieces after a couple of weeks and trialling different ideas, sleeping on it, thinking about it and waiting for the creative muse to speak up all takes time. Now it is made it will be much quicker to make more. As you would be first in line I shall have to make some for the store – but it won’t be for another month – I have some commitments to attend to first. Take your time, Pauline. Something so beautiful is worth the wait! I could never create something so lovely. It is so beautiful and looks like it wants to help. Yes! It seems to have a gentle, helpful energy about it. You have made that in all my favourite colours 😀 Clever you to incorporate elastic to tuck the .05 cent books into. What is the outer spine cover made of hon? Is it book binding tape? I have just bought a pad of Tim Holtz Distressing ink in the very same colour. I’m so excited now. I never thought about using it on fabric. Your bookmark is divine and I like the idea of marking the page too. I’m such a slow crafter, you are a whiz. I’m amazed at how much you accomplish 😀 PS. Texture paint? Where do you by that? What a clever, gorgeous, useful thing you’ve made. This is delightful. I’m amazed at the way you took things apart, beautified them, then brought them back together into a functional piece of art. It’s a masterpiece, Pauline! I also love those colors, and wouldn’t mind a dress or blouse made out of them. I didn’t know you could die elastic. What a great idea. Thanks for the heat-setting tip, too. Do you use a hair dryer, or iron it or perhaps something else? So, I think what you did is stack the notebooks and then find with elastic, but I was wondering how it all comes together on the spine? Does that makes sense? Great post and great project. I wound the elastic quite tightly around the inner spine, stuck down some bookbinding tape over the back of it, then glued that onto the outer spine. When that was all dry and working the way it needed to then I slid the notebooks under the elastic. The idea being that when a notebook is full you can replace it with a new one and the cover will last forever – or as long as it does…… It also means things can be moved about between the covers if you wish. I’m working it quite hard at the moment because I want to make sure it holds up – it is okay so far….. I have a heat setting tool which is a very handy crafting tool for all kinds of reasons – heat embossing, hurrying up drying processes, shrink plastic, Its just like a mini hair dryer but with less blow and more heat. If you use water based inks in your crafts they will always reactivate if they get wet and will rub out of fabrics and such like quite quickly. Heating helps fix them. Also very good for using with any colour sprays such as dylusions etc – drys em quick, handy when layering colours. Spray colours are also excellent for colouring fabrics and lace and ribbons and things like fabric or paper flowers too. Thank you for this explanation. I was missing the inner spine/outer spine detail. Now I’ve got it. That’s clever, too, making the removable. It’s such a beautiful, practical journal. Really inspired. I know about those heat-setting tools you’re referring to. I used one in a class last year. I should pick one up with one of the Michael’s 40% off coupons. They offer that once a week on one item although some things are always excluded. I’ve heard of scrap booking cruises. Wouldn’t it be fun for us all to board a ship for a crafting cruise? Thanks by the way for all the additional tips. When my boys are grown, I’m looking forward to more time for crafting and trying new things. It is probably the only advantage in having your children fly the nest – time and space to create and play! Yep. I can’t imagine this house with out children. I want one! Nicely done Pauline. How big is it though? Is it a regular notebook size, can it fit easily in any bag, or is it gynormous?! Then you may have one! Size is 170 x 110 mm and its about 50mm thick at the spine. Do you do metric? Don’t have my inches ruler here to do the alternate measurement at the moment – but let me know if that is required. Instead of the journal I said I’d make for you and which I haven’t started yet? I am flat tack for about another month, but can make you one then. Wow that’s really awesome of you! I would love one. Thanks Pauline, I cant wait to see it 😀 We do metric but only in long distance, for everything else inches it is, lol! But that size sounds perfect 170x110mm works out to about 6×4″. That is perfect!